With messaging apps on the rise, chatbots are all the hype now. Chatbots are artificial intelligence systems that interact with users via messaging, text, or speech. Many are deployed on chatbot platforms such as Facebook Messenger, WhatsApp, WeChat, Slack, or text messages. Facebook’s expansion with Facebook Messenger has been giving businesses the opportunity to better reach their target audience through different APIs, and chatbots are becoming a necessity in certain industries. Despite the complexity of artificial intelligence used to pick content and context from conversations with users, there are a number of platforms and frameworks available to build a sophisticated chatbot. The ease and accessibility to build a customizable bot alongside the increased usage of messaging apps only proves the growth and strength that will push the chatbot industry forward. As the industry matures, the underlying AI technology continues to develop and grow more sophisticated. According to a recent report by Grand View Research, the global chatbot market is expected to reach $1.23 billion by 2025, a compounded annual growth rate (CAGR) of 24.3%. Projections show growth over the forecasted period as chatbots reduce operating costs for enterprises. Chatbots can work in segments such as marketing, payments and processing, and service, but when it comes to revenue, chatbot service has a majority of the market share. Within the global chatbot market, approximately 45% of end users prefer chatbots as the primary mode of communication for customer service inquires. In a survey by Oracle of chief marketing officers, chief strategy officers, senior marketers, and senior sales executives from France, the Netherlands, South Africa, and the UK, 80% of the respondents said they already used chatbots or planned to use them by 2020. Forty-two percent of participants are embracing automation technologies, 48% are already using automation technologies, and 40% are planning to implement automation by 2020. If companies were already weary of the use of chatbots before, they are now feeling the pressure to integrate more innovative technology to better their businesses. 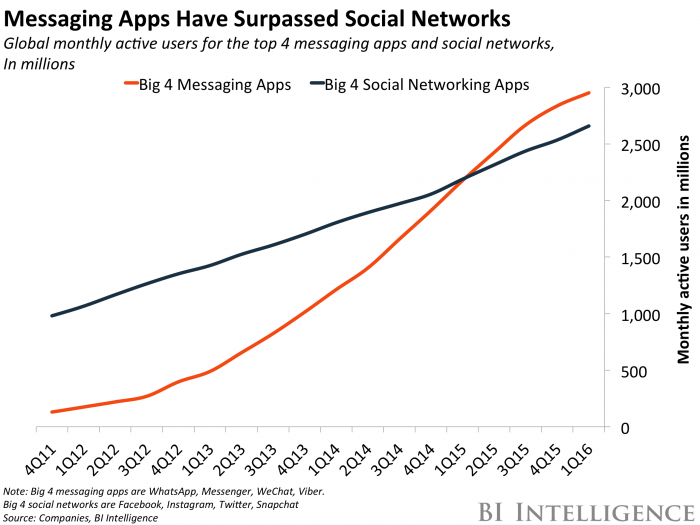 The four top messaging apps surpassed the top four social networks in terms of global monthly active users in 2015, and they continue to grow. The more activity messaging apps receive from users, the greater the opportunity for chatbots to facilitate usage of messaging apps. In a survey by LivePerson, which includ ed 5,000 consumers from six countries, 33% of consumers rated a positive perception of chatbots, compared to the 19% of participants that rated a negative perception. The remaining 48% were indifferent as long as their issue was resolved. Some of AI and machine learning’s biggest advancements in recent years have been in perception and cognition. Voice recognition still has a way to go but Apple, Amazon, and Google have made leaps and bounds on advancements in voice recognition with Siri, Alexa and Google Assistant, respectively. According to a study by Stanford computer scientist James Landay, speech recognition is on average three times as fastas typing on a cell phone, and the error rate has dropped 3.6%. Other improvements such as image recognition have also had reduced error rates. Machine learning systems are now being used to decide trades done on Wall Street and to predict if users will click on particular ads, increasing efficiencies on both the business and consumer ends. In addition to being revenue generators, chatbots can also serve as research bots, or for lead generation and brand awareness to save businesses money. As more businesses and consumers use chatbots, the more demand will exist for better development of chatbots, thus making it easier for companies to implement them within their business. 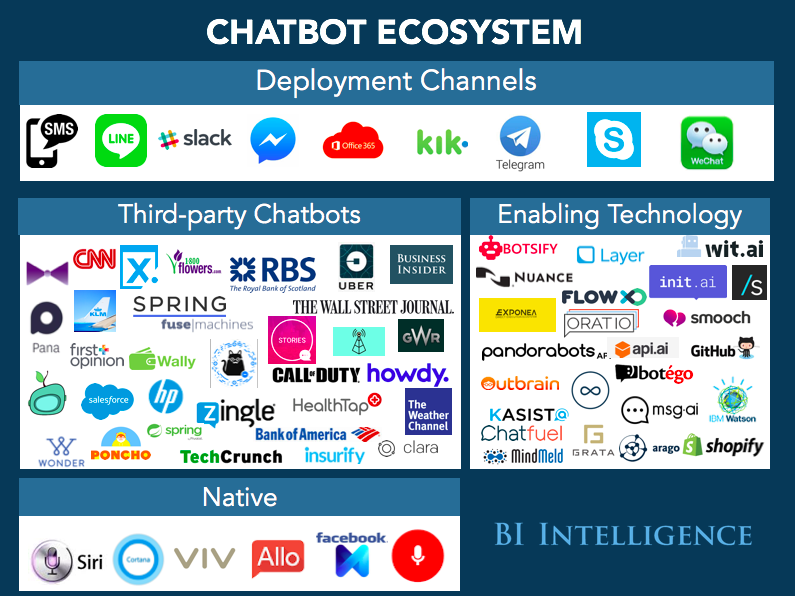 The chatbot ecosystem is quickly expanding despite the relatively robust ecosystem that currently exists. The ecosystem of the underlying technology and platforms for chatbots includ e deployment channels, third-party chatbots, companies that provide the technology for building chatbots, and native bots. Deployment channels such as messaging apps, cloud networks, SMS, and email clients are where chatbots live and interact with users. Third-party chatbots are brands and businesses that a customer may use to, for example, order an Uber through Facebook Messenger. Bot building companies are typically third-party companies that employ AI technology to help businesses deploy their own chatbot across a platform. Finally, native bots are built by the platform or app in which they are operating (for example, Apple’s Siri or Google Assistant). More and more major companies continue to announce their support for chatbots within their own business, such as LinkedIn, Starbucks, British Airways, and eBay. The key players within the chatbot industry, such as Facebook, Google, Microsoft, and Telegram, have been investing in the development of chatbot technologies for years and continue to work on major bot projects. The rise of chatbot usage has launched an abundant amount of startup tech following in their footsteps in a variety of industries. Some chatbot startups such as Kasisto, Pypestream, and Automat.ai, are strong in funding and have the potential to revolutionize the industry.